This is a short poem I wrote today. 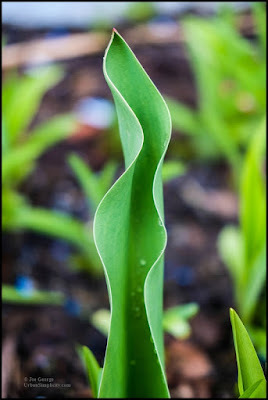 As hokey as it sounds it was inspired by this tulip leaf growing in my teeny front yard. I've lived in this house for nearly 20 years and have not planted tulips. Mostly I plant vegetables. But each year this single tulip re-emerges. And today when I came home from a coffee shop, on a particularly unseasonably cool and wet day, I noticed the tulip leaf which had pushed through the cold ground reaching for the cloud-shrouded sun. The flower will soon follow, as it does each year.